Soils under Britain's allotments are significantly healthier than intensively farmed soils, researchers have found. This is the first study to show that by growing at small-scale in urban areas, it is possible to produce food sustainably without damaging the soil. As a result of the findings, published in the Journal of Applied Ecology, planners and policy makers should increase the number of allotments available, the authors say. One of the greatest challenges facing the growing human population is meeting rising demand for food without undermining the soils on which food production – and other services such as carbon storage, flood mitigation and locking up pollutants – depends. Intensive farming often results in significant declines in soil organic carbon stocks, as well as reducing the ability of soils to store water and nutrients, and damaging soil structure, which can lead to soil erosion. Working in Leicester, ecologist Dr Jill Edmondson from the University of Sheffield took soil samples from 27 plots on 15 allotment sites across the city. She also sampled soils from local parks, gardens and surrounding agricultural land. She measured a range of soil properties, including soil organic carbon levels, total nitrogen, and the ratio between carbon and nitrogen (which are all directly related to the amount and quality of organic matter in the soil) as well as soil bulk density, an indicator of soil compaction. Compared with local arable fields, the allotment soil was significantly healthier: allotment soil had 32% more organic carbon, 36% higher carbon to nitrogen ratios, 25% higher nitrogen and was significantly less compacted. According to Edmondson: "We found remarkable differences in soil quality between allotments and arable fields. Our study shows how effectively own-growers manage soils, and it demonstrates how much modern agricultural practices damage soils." Allotment holders are able to produce good food yields without sacrificing soil quality because they use sustainable management techniques. For example, 95% of allotment holders compost their allotment waste, so they recycle nutrients and carbon back to their soil more effectively. As well as being good news for urban soils, the results underline the value of allotments. "An estimated 800 million city dwellers across the world participate in urban food production, which makes a vital contribution to food security. Our results suggest that in order to protect our soils, planning and policy making should promote urban own-growing rather than further intensification of conventional agriculture as a more sustainable way of meeting increasing food demand," she says. There are around 330,000 allotment plots in the UK, covering more than 8000 hectares, and demand is growing, with more than 90,000 people currently on allotment waiting lists in the UK. However, the heyday for allotments was during World War Two, when 10% of the UK's food came from less than 1% of its cultivated land thanks to the expansion of own growing under the Dig for Victory campaign. 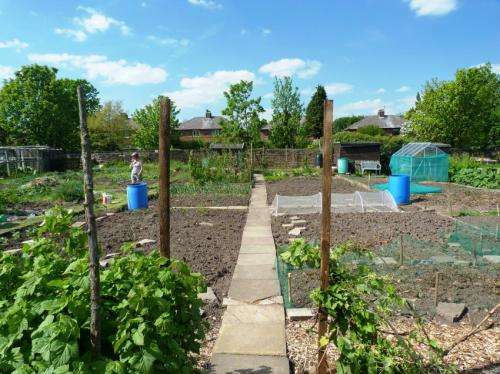 At that time, one in three households in Leicester had an allotment but following a national decline in demand, today Leicester's allotment plots number only 3200 and cover just 2% of urban green space although the city is the second highest provider of allotments nationwide. As well as protecting soils and boosting food security, own growing offers other health benefits, says Edmondson: "Using urban land, including domestic gardens, allotments and community gardens for own-growing is an important and often overlooked way of increasing productivity whilst also reconnecting urban dwellers with food production." "As well as improving food security, studies show that own-growing has direct physical and mental health benefits, and can provide access to sustainably produced fruit and vegetable crops without the associated food miles." More information: Jill Edmondson et al (2014). "Urban cultivation in allotments maintains soil qualities adversely affected by conventional agriculture", DOI: 10.1111/1365-2664.12254, is published in the Journal of Applied Ecology. This is good news but it is also time to face the real problem that is approaching like a heavy train - continuation of exponential population growth rate everywhere except in EU and US. This is not sustainable and we should start to deal with it.